What is Conservative Treatment for Children? Why does the American Association of Orthodontists and the American Board of Orthodontists recommend children be evaluated by an accredited orthodontist by age 6? What is Conservative Treatment for Children? Why does the American Association of Orthodontists and the American Board of Orthodontists recommend children be evaluated by an accredited orthodontist by age 6? It may surprise you that “Modern” Orthodontic Braces have been around since 1925 with the American Association of Orthodontists being established even earlier in 1900. Over the last hundred plus years, there have been many changes and improvements to the way Orthodontists approach treatment. Initially various headgears were a primary mode of treatment used to pull front teeth by way of bars locked around the front and back of whole segments of teeth. This gave way to individual brackets and wires which were used to expand out arches increasing the circumference until the individual teeth were straight. When many of these cases failed (collapsing back inward), Orthodontists began to remove a bicuspid in each quadrant to create symmetrical spaces and prevent dental expansion during alignment with fixed “braces”. Unfortunately as many of these patients aged, the spaces re-opened and even when teeth remained stable, the dental arches were narrow and the patients’ faces continued to grow without lip support creating a typical concave or “witch” profile. Since then, Orthodontists have learned to find middle ground. If crowding is severe and the face is full (teeth are pushed forward), we will likely still recommend removal of four bicuspids and full braces as before. But as is the case many times, if there is only moderate crowding and a narrow upper jaw early, or if the lower jaw is recessed and there is severe overjet with a narrow upper jaw, we have learned to expand the upper jaw and restore ideal arch width (or even place more advanced appliances that can further modify growth and development); this increases the circumference of the bone itself and allows alignment of teeth into a more stable position, usually without removing permanent teeth. Since the arch was narrow to begin, any facial changes only improve the esthetics if they are noticeable at all. We have also learned that the development of the lower arch and even growth in the lower jaw is affected by constriction from the upper jaw; removing constriction by expanding a narrow upper arch allows the lower jaw to grow without impediment and allows the tongue to push naturally on the lower teeth, uprighting them into a more full arch form. When needed, the earlier the expansion, the more time the tongue has to push on the lower arch and upright lower teeth and the longer the jaw has to “catch-up” during growth. In the long run, these patients have less crowding, a full smile and a straighter (more ideal) profile. 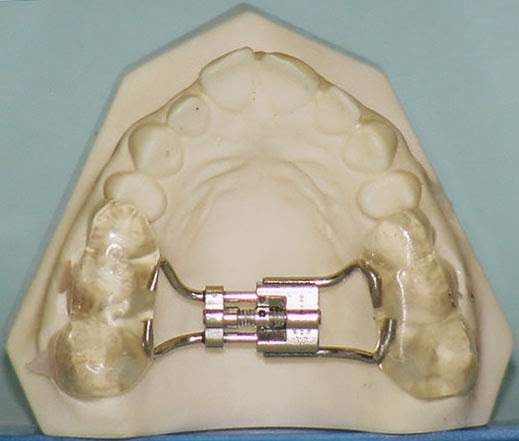 Additionally there are far fewer impacted teeth while stability is dramatically increased since any future tooth movement is minimized to simple alignment versus large tooth movements to pull teeth back into the arch or close extraction spaces. Does this mean every patient needs expansion or early interceptive treatment? The answer is of course, no. However there are many borderline cases that will need some space (i.e.3 to 6mm) where removal of bicuspids produces too much space (16mm). If nothing is done to increase the jaw size then the Orthodontist must either reshape teeth or remove some altogether. As a specialty, we have learned to make compensations when we have to; not every patient can receive a 100% result since most patients don’t get to the Orthodontists until growth is near complete (age 12 to 13) and a 90% correction is normally acceptable but most patients have a “best-time” to treat to minimize treatment and sometimes prevent extractions or even later surgery. There are many adults who have had acceptable results as a child which relapsed later due to this jaw size discrepancy. severe malocclusion), some are a wash and some may be a slightly more expensive due to the added cost of future full braces to finish alignment once all teeth have erupted into the new arches. What you get from the effort will be greater stability with a more natural and esthetic smile and fewer compensations in the angulation and alignment of the teeth. Braces may still be recommended as the remaining permanent teeth erupt and growth subsides however movements required will be greatly reduced which generally reduces cost of the braces. In some cases the early treatment alone may prevent later braces. So when is early intervention necessary? Are braces necessary at all? Should we replace missing teeth or just close the space? Should we correct underbites or excessive overjet? Is it for esthetics or function (or perhaps a combination)? What is the most Conservative treatment? I would say the question really should be: How can my child have the best and most stable smile possible with the least possible effort and most possible stability? In other words if you plan of fixing your child’s smile, why wouldn’t you want the best options presented? As a Board Certified Orthodontist, I offer to every patient what I would do/have done for my own children; I offer the best possible outcome for each individual situation. I will not tell you it is the only way if there are options but I will tell you what to expect with different options. Does that mean you have to go with 100% of what can be done? No, but we do want you as the parent to understand your child’s developing occlusion while we still have time to correct developmental issues. There are considerations (time, behavior of the child, expected compliance, cost, etc.) that may lead us away from early treatment and we will always show you multiple finished cases so you know what we can provide and have provided for many years. This is not to say accredited Orthodontists (including myself) cannot or will not provide treatment later with compensations such as extractions/surgery/more extensive braces, but I will leave the options to you as the informed parent. So what does this all mean for you and your children? Keep in mind there are many well qualified Orthodontists and we all do things a little different; a good accredited Orthodontist will always be able to provide a successful correction and a beautiful smile at any age, whether it be with removal of permanent teeth, surgical movement of the jaw or with comprehensive braces/invisible trays. But as long as kids get there traits from two parents there will be a high probability that jaws don’t match each other and/or tooth size doesn’t fit jaw size; additionally there are factors we cannot control affecting development such as allergies, swallowing patterns, tongue thrust, thumb-sucking that all can and will greatly alter upper jaw size during growth (before the teeth have a chance to erupt). The more adverse the development, the more important timing of treatment will play in the overall correction result. If you have questions or comments concerning this or any orthodontic question, please feel free to make a complimentary new-patient appointment at either my Steiner Ranch location or down at my North-central Austin location on 35th street. For many years, expanders (RPE) have been used by orthodontists to correct misfit jaw sizes or crossbites by pushing the two bones of the upper jaw apart from each other thereby widening the upper jaw. In turn, the lower jaw would fit better and there would now be a larger circumference in the upper arch making more room for crowded teeth. The lower arch which may have been shifting from one side to the other due to a poor fit now would re-center itself and the remaining crowding would be treated with traditional braces. However sometimes the upper jaw can be just as narrow and during development in the lower arch, the lower teeth become restricted within the upper arch. Instead of a crossbite where you see a narrow upper jaw and normal sized lower jaw shifting sideways into a crossbite, the lower teeth can collapse or lean inward toward the tongue creating a smaller circumference and severe crowding (a small upper jaw can lead to a small lower arch form). This can actually push the lower backward and restrict growth leading to severe overjet. As the lower teeth lean inward, they continue to block un-erupted teeth and we start seeing impactions (un-erupted teeth locked down deep in the bone without room to erupt) which cause teeth to cross over each other and can even lead to developing roots being destroyed. In the recent past, when there was a narrow upper jaw and lower jaw, orthodontists would remove teeth (extract all 1st bicuspids) so that the remaining teeth would fit into the narrow arches. Over time these cases would show a lack of lip support and through continued growth the nose and the chin would grow and the lips would appear to sink inward creating a concave or “witch” profile. What we as orthodontists have learned from this is that when we see a narrow upper jaw with crowding of the front incisors at age 6 to 7, and we see crowding of lower incisors as they are erupting, we know if we restore the width of the upper jaw to accommodate all future teeth, we will likewise remove the constriction to the lower jaw and the tongue will push on the lower arch to upright teeth and restore adequate arch length in the lower arch as well. In most cases, this will make future extraction of permanent teeth un-necessary and will reduce the time in future braces or may even eliminate the need for braces later. In simpler terms, think of jaw size (or circumference around the jaw) in both the upper and lower arches versus the actual added widths of all teeth. If the width of all teeth within an arch is greater than the circumference of bone, then they will not fit since the width of the jaws from molar to molar does not change past age six. To see the widths of un-erupted teeth , as the permanent teeth develop long before they erupt, an orthodontist will take a panoramic x-ray. Severe crowding would signify a lack of arch length. This means that as soon as a child’s upper jaw is identified as narrow and crowding begins to appear in the front incisors, expansion can be used to restore arch length and thereby allow adequate space for future teeth to erupt instead of letting them crowd more and more until they become either impacted or too crowded to fix without removing permanent teeth. In truth there are other factors that help determine the need and timing of expansion (RPE) since as natural mesial drift of teeth, shifting of the lower jaw, parental facial patterns and positions of teeth; a well trained certified orthodontist will help guide you during the treatment planning process but you have to see one first! This is why the American Dental Association, American Association of Orthodontists and the American Board of Orthodontists all recommend kids see an orthodontist by age 6 to determine growth and possibly identify developing issues that will affect teeth later. Dr. James R. Waters is a practicing Board Certified Orthodontist in Austin, TX. He is a 1996 graduate from UTHSC Dental School in San Antonio, 1997 graduate of Advanced Dentistry from the UNMC in Nebraska and the 2001 Valedictorian graduate from the prestigious Saint Louis University Orthodontic Program receiving the J.P. Marshall award for clinical excellence in 2001. He holds a Bachelor’s Degree in Science, Doctorate in Dental Surgery, a post-doctorate certificate in Advanced Dentistry, post-doctorate Degree in Orthodontics & Dentofacial Orthopedics and a Master of Science Degree in Orthodontics. Dr. Waters and his wife of 18 years live in Austin, TX with their 4 children where he has a thriving, multi-faceted Specialist practice. You can learn more about Dr. Waters at BracesAustin.com. Many young patients have upper and lower jaws which do not fit together. Probably the most common issue related to a poor fitting bite is a narrow upper jaw relative that patient’s lower jaw. This narrowness can be caused from overactive muscles of the face restricting the upper jaw development (i.e. thumb-sucking, lip sucking), genetics (i.e. mom’s upper jaw and dad’s lower jaw), and/or mouth-breathing (when a patient’s nasal air passages are blocked frequently enough to prevent breathing through the nose). Mouth breathing is particularly common in regions with higher than average allergens such as Austin. When a patient breathes through their mouth, the tongue rests on the floor of the mouth while the cheeks push inward from the sides, thus constricting the upper arch of teeth. Compare this to breathing through the nose which requires the tongue to be raised against the roof of the mouth, behind and against all of the front teeth. With the support of the tongue against the inside of the upper teeth, the force from the cheek muscles is balanced and there is no tooth movement or resistance to growth. Once the upper jaw is too narrow to fit well with the lower jaw (termed a crossbite), the lower jaw can shift to one side or the other so at least some of the back teeth fit well. It will also constrict the development of the lower arch causing severe crowding. If a shift remains throughout growth, or the constriction remains, the lower jaw can begin to grow more sideways, become asymmetric, and/or remain smaller creating a long-term discrepancy between the size of the teeth and the size of the arch. This is the reason crossbites are corrected as soon as possible after the permanent first molars erupt, around age 6 to 7. Expansion is performed by pushing two bones of the upper jaw away from each other and allowing bone to form in the middle. The upper jaw bones are easily moved as a child but fuse in the late teens making expansion increasingly less successful as the child becomes an adult. Expansion can be successfully performed in all patients up to age 15 (although side effect from years of ill-fitting jaws may not be easily reversible). Past age 15, the bones of the upper face begin to fuse and it becomes more difficult to expand the upper jaw. After 18, most patient will require surgery for expansion (the surgery simply re-opens the space that used to exist between the bones). 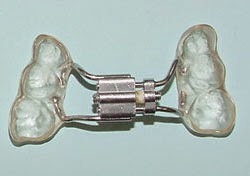 Bonded Expander as it looks in the mouth. ﻿﻿﻿﻿﻿﻿﻿Dr. James R. Waters is a practicing Board Certified Orthodontist in Austin, TX. He is a 1996 graduate from UTHSC Dental School in San Antonio, 1997 graduate of Advanced Dentistry from the UNMC in Nebraska and the 2001 Valedictorian graduate from the prestigious Saint Louis University Orthodontic Program receiving the J.P. Marshall award for clinical excellence in 2001. He holds a Bachelor’s Degree in Science, Doctorate in Dental Surgery, a post-doctorate certificate in Advanced Dentistry, post-doctorate Degree in Orthodontics & Dentofacial Orthopedics and a Master of Science Degree in Orthodontics. Dr. Waters and his wife of 18 years live in Austin, TX with their 4 children where he has a thriving, multi-faceted Specialist practice. You can learn more about Dr. Waters at BracesAustin.com.